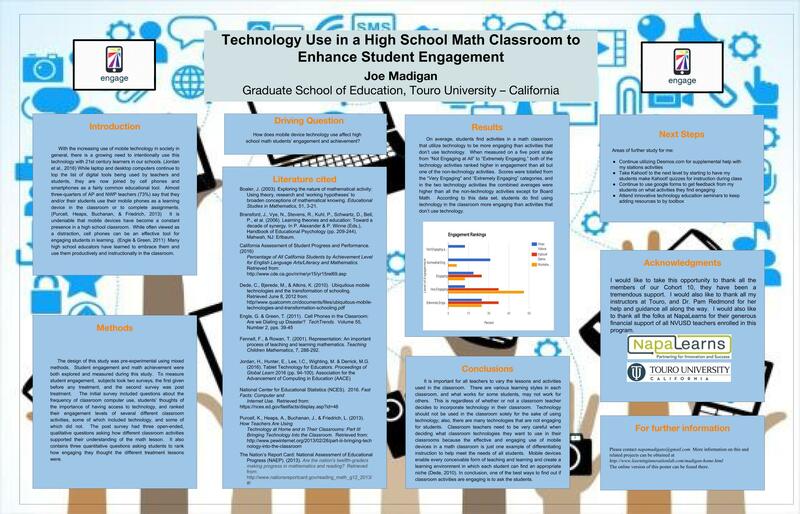 The purpose of this study was to examine what effects using technology in a high school classroom had on the engagement and achievement of math students. Because California’s high school students are consistently scoring below average on state and national tests, engagement needed to be examined in the mathematics classroom. In a world of prevalent and dynamic technology, today’s students need the necessary skills and strategies to engage and learn new mathematics material, using a variety of methods. Throughout this study, students’ attitudes and beliefs about technology were recorded. You can find my entire research paper linked here. Click on the poster below for an enlarged version.